New York practice John Puttick Associates has won the competition to redevelop the Brutalist 1960s bus station in Preston, England, with a design that features a rooftop football pitch, a climbing wall and a skate park. John Puttick Associates was selected through a RIBA-run competition to overhaul Preston Bus Station, which was designed in the 1960s by Keith Ingham and Charles Wilson of architecture firm BDP. The £13 million scheme will include the preservation of the existing bus station structure – granted Grade-II listed status in 2013 – and the creation of a new youth centre. The winning design involves renovating the old building and retaining its rows of concave concrete fins, allowing it to continue to function as a primary transport hub for the city. A new youth centre will be affixed to one end. The OnSide Youth Zone will feature sports facilities including a climbing wall and a rooftop football pitch, while a public courtyard in front of the station will be redeveloped to create a skatepark. "The Preston Bus Station development is an important opportunity to create a destination that makes a genuine difference for both visitors and the local community," said John Puttick. 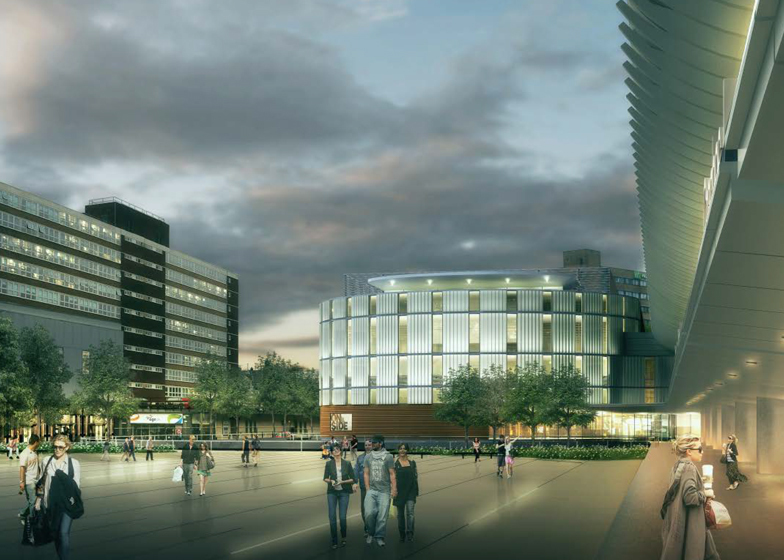 The £13 million project forms part of a larger redevelopment of Preston city centre. "The three components of the project – the revitalisation of the Modernist bus station, the new OnSide Youth Zone, and a large outdoor public space – offer a rich mixture of uses and the challenge of sensitively introducing contemporary design to the existing setting," added Puttick. A panel of judges headed up by British architect Hugh Broughton selected the winning entry from an anonymous shortlist. The four runners up have now been named as local firm Cassidy + Ashton, Igor Russo with Flanagan Lawrence Architects from London, French studio Sane Architecture and Nottingham-based practice Letts Wheeler Architects. The judges took into consideration over 4,000 votes cast by members of the public during a two-day consultation event at the station in July. "Preston Bus Station is a hugely significant 20th-century building and all the shortlisted architects have responded to its bold architecture with skill and empathy," said Broughton. "John Puttick's winning scheme cleverly resolves the requirements of the On Side Youth Zone to create a building which will be fun, safe and engaging to use while celebrating the original architecture of the bus station and providing flexible open space, which can become a focal point for community events at the heart of Preston life." Preston Bus Station was saved from demolition following a prolonged conservation campaign supported by eminent architects including Richard Rogers and OMA. It was granted Grade-II listed status in 2013 – unlike its ill-fated contemporary, Robin Hood Gardens. While the majority of the funding for the project will be raised from public and private investment, the Preston Youth Zone charity and Lancashire Country Council will contribute £1 million and £5 million respectively. Preston Youth Zone will work with John Puttick Associates to finalise plans for the centre, which will then be submitted to the public body Historic England for approval.